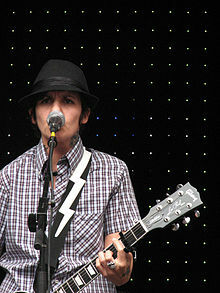 The Cliks are a Canadian rock band consisting of Lucas Silveira (vocalist/guitarist), with rotating members. The Cliks' major label debut album, Snakehouse was released on April 24, 2007 by Warner Music in Canada and by Tommy Boy Records in the United States. The first album predated Silveira's gender transition. Silveira later worked with Morgan Doctor and Jordan B. Wright to record Snakehouse. Wright left the band shortly after the album was completed and was replaced by Jen Benton on bass. Martinez was added as the second guitarist. The breakthrough lineup of the band were all out members of the LGBT community. Silveira is a trans man, Benton and Martinez and Doctor identify as queer. The Cliks have been compared to the likes of David Bowie and the White Stripes with the release of their first album, Snakehouse. Native to Toronto, they are the first band with a transgender leader to be signed with a major record label. The “emotional and guitar-driven” album features the single "Oh Yeah" and a cover of Justin Timberlake’s "Cry Me a River". On October 21, 2008, The Cliks announced on their MySpace blog that Nina Martinez was no longer in the group. No explanation as to why was given or that they planned on replacing her at the time being. All that was said was that they are concentrating mainly on the new album and that all is going "extremely well at the studio." Their third LP, Dirty King, was released June 23, 2009 and the title track became a moderate hit on Canadian rock radio. The album's moderate success led the band to an opening gig for the New York Dolls on their Spring '09 North American Tour and slots on the Toronto and New Jersey Pride Festivals. Although no specific information was given on why the rhythm section had decided to abandon the band, one bit of Silveria's post does hint at conflict between the band members. Fans and bloggers have speculated the breakup to be quite acrimonious as Silveria's personal Facebook page no longer includes Doctor, Benton or Martinez as "friends." On November 8, 2009, in a message posted on The Cliks' official MySpace page, Silveria announced that Brian Viglione and Tobi Parks (formerly of St. Louis band The Star Death) had joined the band. That soon ended when Lucas Silveira decided to take a hiatus to begin testosterone hormone therapy which would affect his singing voice. After successfully transitioning, Silveira later released a solo EP of cover songs and two original tracks titled "Mockingbird" 2010 (Indie) with producer Hill Kourkoutis. The Cliks now consist of Lucas Silveira and rotating members that in the past have included primarily Hill Kourkoutis on bass (Hill and The Sky Heroes), Patrick McKeegan (AKA Patrick Von Ghostwolf) (Die Mannequin). Other musicians who have joined The Cliks also include on bass Carmen Elle (Army Girl), Jungle Tshongo (Birds of Misfortune) and on drums Jesse Labovitz (Ride The Tiger). The Cliks were the first band with an open trans man as a leader signed by a major record label, Tommy Boy Entertainment. Rosie Lopez, head of A&R of Tommy Boy says that "It’s the music, not Silveira’s gender that will draw in the most dedicated listeners." During the summer of 2007 The Cliks were a part of the multi-artist True Colors Tour, which traveled through 15 cities in the United States and Canada. The tour, sponsored by the Logo channel, began on June 8, 2007. Hosted by comedian Margaret Cho and headlined by Cyndi Lauper, the tour also included Debbie Harry, The Gossip, Rufus Wainwright, The Dresden Dolls, The MisShapes, Erasure and other special guests. Profits from the tour benefited the Human Rights Campaign. The Cliks appeared again as part of True Colors Tour 2008, along with Cyndi Lauper, The B-52's, Tegan and Sara, and other special guests. ^ "No-Shtick Cliks: Garage Popsters Avoid Gay Clichés", NOW, June 24, 2004. ^ Rayner, Ben, "A band that Cliks". Toronto Star, May 24, 2007. ^ Laura Vess, "The Cliks' Lesbian Band Members Fly Solo". ^ Robin (2009-12-15). "The Cliks, Reinvented and It Feels So Good: The Autostraddle Interview & Photoshoot". Autostraddle. Retrieved 2016-02-12. ^ a b c "Transgender leader of Cliks makes statement". MSNBC.com, July 9, 2007.